Big investments need a long life. The proper management of construction equipment will help you get the most from your investment and enjoy the safe operation of the machine. You can extend the life of the components and improve uptime with daily preventative tasks, regular construction equipment service and well-trained equipment operators and technicians. Think about how you’re going to get the most productive life from your heavy equipment right from the day you buy it. Consider all the factors that are important to your business activities. Higher productivity may trump the convenience of easier maintenance tasks. You may also want to consider how brand reliability and training support will be more important than a lower purchase price. Advancements in heavy equipment technology provide high yields in productivity and efficiency, but if operators don’t have proper training on best practices for these new technologies, you won’t be able to realize those benefits. Since construction equipment will lose its value over time and through use, it’s vital to use the best approach to make a profit with each piece of equipment. Whether dealing with new or used equipment, it is the job of the equipment manager to get maximum life and profit out of the equipment investment. The goal is to maximize productivity while operating the equipment as cost-effectively as possible. Informed purchasing, heavy machinery maintenance, thorough training and fleet monitoring make up the bulk of an efficient equipment management program. The little tasks and major processes are vital to the longevity of equipment. If you don’t already have an extensive fleet management program in place, there’s no time like the present to start implementing some or all of the components discussed below. Record-keeping could very well be the most important aspect of an effective preventative maintenance program. At every stage of a preventative maintenance program, consistent record-keeping is the glue that holds all the different elements of your plan together. Take the time to track as much as possible to effectively manage your fleet. You’ll see the rewards with more dependable equipment and an increased ROI when your heavy equipment needs less time on major repairs and stays in better shape for long-term use and higher resale value. Purchasing. Develop a process for the purchasing of your heavy equipment. This may include sourcing a few vendors you’d be interested in buying from, compiling a list of the main features and benefits you’re looking for in a heavy equipment purchase, and comparing all your research in a spreadsheet. Operator Training. In-house and dealer training is essential to getting the most from the capabilities of your equipment. The operator is your source for quick detection of equipment issues, and they are also an excellent source of feedback on the functionality you paid for. Their insights and knowledge help fleet managers make better buying decisions for future purchases and keep costs under control for current equipment. Make sure they have as much information as possible about the equipment they’re using. Technician Training. The best technicians are trained frequently by manufacturers and technical schools. To keep your team up to date on new technology and practices, offer technician training throughout the year. Scheduled Maintenance. Preventative maintenance can make all the difference. When properly scheduled, the machine is in the shop during its low-demand times, and production time is rarely affected. Consumables. Managing the purchase and use of common equipment parts such as filters, belts and tires will enable you to reduce costs and repair time. You may be able to strike up a deal for bulk purchases to reduce costs of parts. You’ll also want to look at how and where these common parts are used, so you can ensure appropriate stock levels are available on the job site and in the shop. Repairs. Diagnostic analysis of fluids, determining causes of equipment failures, and equipment cleaning and service make up a big chunk of preventative measures. With proper fluid analysis, you can greatly reduce unplanned downtime of equipment. Keeping equipment clean is the best way to avoid corrosion that can quickly deteriorate components. Sizing of fleet. Know when you have enough and know the best time to get more. The size of your fleet is directly related to production, and it will determine the number of technicians you’ll need to maintain your fleet, which will also affect administrative needs. This trickle-down effect adds to your costs. You need to monitor and control it to achieve a profit. Equipment disposal. Look at the various metrics of equipment history when you’re considering selling or disposing of a unit. Compare the average cost per hour and average labor cost along with other factors concerning performance and repairs to identify equipment that’s not earning its keep. When a piece of heavy equipment costs more than the average equipment cost, you know it’s time to get rid of it. All of the eight points listed above rely on the proper recording of information related to each piece of equipment. Without service notes, purchase history and information collected on equipment runtime, it’s impossible to implement the most effective heavy equipment management steps. Doing a walk-around inspection with a heavy equipment preventative maintenance checklist will help the operator remember what to look for and be able to recall that information more clearly if questioned. The inspection sheet is submitted, and a mechanic can refer to it to determine service requirements and possible repair situations. You can run a report for the fleet manager to see how much that piece of equipment is really costing the business. All this data is instrumental in keeping costs down and production up. 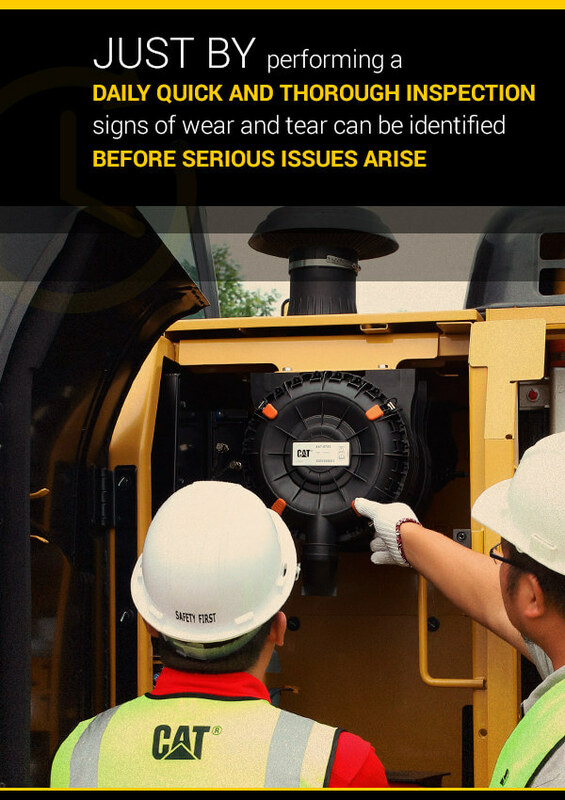 Your equipment operators play a key role in the health of your equipment — not only because they are the ones running the equipment for long periods, but also because they can pick up on the little abnormalities that indicate oncoming issues. They should regularly check components and document the operation of specific equipment. That way you’ll have reliable records that will clearly indicate the level of service needed when the equipment goes in for its regularly scheduled service. A long-term record of daily inspections, equipment service performed and easily accessible documentation of the history of the equipment (such as the age of components and cost information) will also help identify bigger issues before a major breakdown occurs. Thorough records are good indicators for when the life of the machine may be nearing its end. You should also incorporate quality control measures to be sure your maintenance program is being followed on all levels. This includes using software for information-gathering and monitoring. The most effective software alerts you when maintenance tasks aren’t recorded, so you can take the steps to get the program back on track. 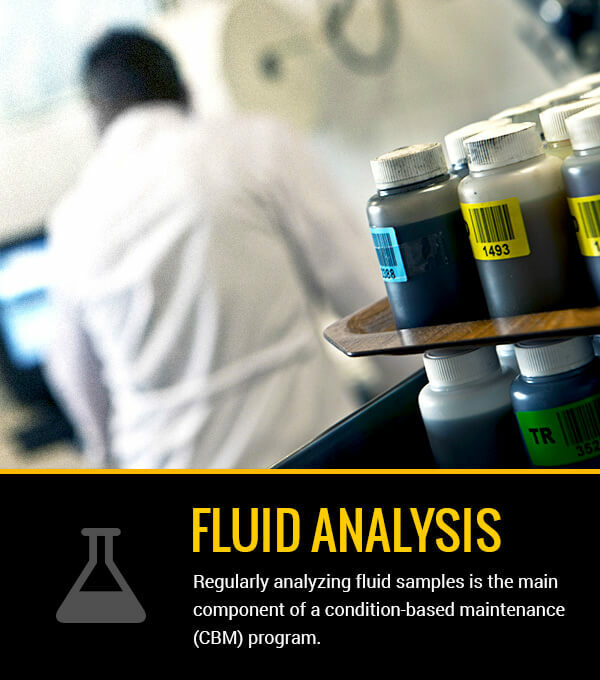 Regularly analyzing fluid samples is the main component of a condition-based maintenance (CBM) program. With this proactive approach, you can better manage your equipment. Instead of unplanned downtime, you can schedule repairs and save money thanks to increased productivity. The particulates in fluids and physical properties of the sample provide a range of information about the state of the various components that rely on fluids. The main fluids analyzed in heavy equipment are hydraulic system fluids, engine oil, coolants, fuel, transmission fluids and differential oils. By continually monitoring fluid properties, you will be able to capture vital information that will indicate early warning signs of a specific component requiring repair or replacement. CBM does not replace the traditional maintenance scheduling based on elapsed time or operating hours. This is an additional program that you can use to gather more precise information about the condition of your equipment and the health of its various parts. You can include fluid sampling during a routine inspection and have it analyzed in house or sent to your equipment dealer for expert analysis. At Whayne Walker, we offer S•O•STM Fluid Analysis service for all Cat equipment. With this program, we take fluid samples at regular intervals. The first step is to establish a sample history, which we’ll use to determine deviations that would indicate signs of contamination or weakening. Then as sample data accumulates, we can uncover trends that indicate potential problems while they’re small and easy to take care of — instead of waiting until there are obvious indicators of poor equipment performance. Your first decision in starting a condition-based maintenance program is who will complete the fluid sampling and analysis. You can have your own personnel perform the fluid sampling, if you have people who have been or can be trained on proper sampling methods. Most equipment dealers offer services for fluid sampling and analysis for their brand and will often offer training for your employees to perform proper sampling procedures. You also have the option of hiring a third-party supplier to provide fluid analysis of your samples. The common way to collect samples is during regularly scheduled maintenance when equipment is in for scheduled fluid changing. The sample is taken prior to any service work according to the proper sampling methods for the particular machine. The best way to collect samples is by using the sampling pumps, containers and tubing for fluid extraction available from fluid analysis suppliers. Our equipment service experts will be able to help you determine which package is best for your specific situation. We also provide instruction on how to take proper fluid samples to obtain the most appropriate sample for analysis. Fluid analysis is a highly effective step in prolonging the life of your heavy equipment and preventing unexpected breakdowns. Thanks to a consistent data stream, you can easily identify problems early. For example, an excess of chrome in the sample is an indicator there is an issue with your ball bearings. Just like any preventative maintenance program, you need to develop a systematic approach to implementing the program and responding to abnormal or critical fluid analysis results. Depending on the results, you may decide to replace a part, increase monitoring and sampling, or perform maintenance tasks sooner. By monitoring the fluid condition of your machine, you’re taking construction equipment management to a higher level of excellence. A construction site is full of hazards. The heavy equipment that is vital to completing construction projects are one of the most dangerous elements on a construction site and can cause serious damage or tragedy to people and property. There are many steps you can take to keep your machines, workers and site safe. By regularly inspecting equipment, keeping maintenance records and developing procedures for potential equipment issues, you’ll be able to avoid common malfunction problems. Performing regular inspections of equipment will practically eliminate breakdowns from bucket mechanics or hydraulic lines. A blown line can cause all kinds of dangerous situations such as a boom and arm releasing onto people or property. Heavy equipment hydraulics are under intense pressure, so you can imagine the type of pressure that would release if a line bursts. Just by performing a quick, thorough inspection every day, signs of wear and tear can be identified before serious issues arise. You can adapt this list to various types of heavy equipment. Specific equipment will have unique parts you should add to this list. For example, the articulated joint should be checked on a loader and an inspection for a crane would include a thorough examination of the cables and hook. In the construction industry, safety is the top priority. It will affect your bottom line in different ways, either negatively or positively depending on what systems and procedures you put in place to ensure employee and equipment safety. If machine operators don’t have to deal with poor equipment performance, they are better able to stay focused on the task at hand. Your team will be able to perform jobs more efficiently while experiencing less stress. When you have properly trained and knowledgeable employees, you’ll get the maximum life from your heavy equipment. Your equipment operators, site supervisors, fleet managers and project leaders all have an important part in keeping your backhoes, dozers and wheel loaders in top shape for each job. Proper training for technicians and equipment operators should be a top priority for managing construction equipment. These great advancements in heavy equipment design are beneficial if they’re used properly. Without appropriate training, new design and functionality just looks complicated and unappealing. Machine operators are committed to jumping in the seat and getting the machine to work the best way they know how. Without training on what the machine is capable of, they’ll continue to use the old methods that may not be taking advantage of productivity features and efficiency modes. Technicians should be trained with support from your OEM and dealer to keep them updated with new technology. By sticking with one or two construction equipment brands, you’ll have more uniform and consistent maintenance procedures and practices. It helps technicians become familiar with the designs of specific manufacturers, making it easier to diagnose equipment issues. You’ll also be tuned-in to advances in equipment technology and benefit from the familiar training, product support, tools and equipment parts that will be common, even with different models from the same manufacturer. Technicians will also be highly knowledgeable about the manufacturers’ recommended maintenance schedule and other recommendations when they are only dealing with products from a single company. While you may incorporate a few specialized maintenance procedures depending on your company policies and geographic work site, the manufacturer knows the machine best. Following their recommendations will make your fleet management easier and more effective. Continual and high-quality maintenance will keep your heavy equipment fleet in optimal condition. Weather, harsh geographic conditions and constant operation are all factors that need to be counteracted with a thorough and data-intensive preventative maintenance program. Implementing GPS tracking on your fleet is beneficial for a variety of reasons, the least of which is to better track service and repairs. Maintenance management is more streamlined with automatic data capture and electronically monitoring run time, idle time and service scheduling. By viewing usage reports, you can determine which equipment may not be beneficial to your bottom line. Even with all the best technology in software and equipment, people are still the best resources to make managing construction equipment a cohesive operation. Your own personnel and those of manufacturers, dealers and third-party suppliers will be instrumental in working through all the carefully planned processes of equipment management. With a rich source of technology and people to maximize the life of your heavy equipment, you can expect profitable returns that fuel the success of your business. Whayne Walker is your dependable source for service and expert knowledge of Cat equipment. With 17 locations in Kentucky, Southern Indiana, West Virginia and Southeastern Ohio, we’re here to help you out 24/7 with all your parts and service needs. Our extensive parts inventory and highly trained technicians mean we get our work done quickly, so you can get your equipment back to work. Contact us for information and to schedule service on your heavy equipment fleet.